Michihito Mizutani is a interaction designer who has been researching the unconscious communication that occurs between people. He is translating this research into objects that help us communicate on another level, for example in his 'Tasting Music', 'Talking Glass', 'Sharing the Moment', 'Emotional Communication'. 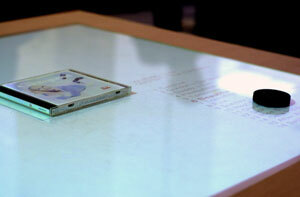 This table recognizes which CD jacket is placed on it and shows the song list of the CD. The user can chose and play any song by moving the mouse device. It is almost impossible to talk about a sound of a piece of music with your friends if you can not hear the sound of the music played. This table is meant to be situated in a cafe or a music shop, where people can eat, drink and chat with friends. These are all comfortable situation, and listening to music also helps to create a comfortable situation.